I've been handloading for awhile now, about 7000 rounds behind me, various pistol calibers and some rifle as well. I've loaded about 2000 9mm, and fired most of them without issue. Most of these were in my old SR9c, a carbine, and a Taurus which I now wish I hadn't sold. I had run some of my reloads through my CZ 75b (it's relatively new, maybe only 3-400 rounds), but none of the RNFP reloads, which had shot fine in all the above, previously. I was loading them between 1.125 and 1.135, depending on how warm, but nothing too hot. I took a couple of boxes of these to the range with me yesterday (1.125's) and promptly jammed my CZ on the first feed. Managed to get it closed, cycled a couple, jammed again, and I gave up and went home. Did some experimenting last night (made some dummies and pulled the barrel), and it turns out I have to load them around 1.060-1.070 to get them to sit properly in the chamber. I see a few random postings in THR and similar, but most got their 75b to feed at about 1.115, which I'd be fine with. The lowest published load I found was for 1.090, which makes me really skittish about loading down at 1.060. I know I can load them shy, powder-wise, but the whole thing feels like a kludge to me. I'm wondering if I've got a barrel that's not quite reamed fully? I took out some S&B 124's (RN) last night too, with my barrel removed, and some of those wouldn't seat cleanly either. Pete, Welcome to the forum. Sorry you're having some problems, but we should be able to help. First, the CZ (and XD) have shorter chambers than many other pistols, This chamber shortness also is credited for CZ's accuracy. This usually shows up when loading "FT" and "HP" bullets, especially with conical noses. The straight & long bullet sidewall makes contact with the cone/rifling at shorter lengths than many pistols. Bullets with a traditional ogive nose shape, usually run smoothly at common lengths. "Wobbly" has excellent pictures and cartoons that illustrate what happens--do a search.. The "FIX": always test new bullets for chamber fit. Use a "spent" "unsized" case that the new bullet can be inserted into slightly "by hand"---just far enough to hold it in place. With the bbl removed, push this dummy round into the chamber slowly but firmly until it seats fully on the case mouth. Turn the bbl up and "gently" pull the dummy rd out and measure it. Do this with several cases and bullets to get a consistent measurement. This length IS TOUCHING THE RIFLING/CONE. Subtract .015" from that length and you have the maximum oal that will reliably feed in THAT pistol with "THAT" particular brand and type of bullet. This is actually easy to do and only takes a few minutes.. Find load data for that type and weight of bullet at that max usable oal or shorter. I can't explain the S&B RN problem without actually looking at it myself. I don't shoot/load S&B. With a NIB CZ, many suggest shooting 500 rds of 115gr FMJ WWB or Federal from Wal-Mart to beak it in and loosen it up . Rem/UMC has a history of problems with some guns, so I recommend avoiding those until after the gun is broken in. We also need MORE INFO to maybe add some experience to our suggestions.. 1. Bullet Manufacturer, specific nose type (FP-Conical etc), powder, oal, Load Manual Source. I'm sure others will add what I may have omitted. Thanks, I understand the actual contact problem (the ogive shape relative to the short chamber), but where do you get max OAL info for a given bullet? I also understand how to figure out my OAL for seating, done a fair amount of that previously, in particular on rifle where it's more critical. On my .308 I've got my setback down to a couple of thousandths, for example. I don't think I've ever seen bullet data published for maximum OAL of a given bullet for feeding, wouldn't this depend on the chamber (such as the short one in the CZ)? I'm probably missing something here, in terms of how to figure this out, BEFORE I purchase the bullets (typically I mail-order lots of 500 or 1000, the closest reloading place is about a 2-3 hour round trip, and is very spendy). +1 to everything 1SOW said (and Wobbly's graphics). 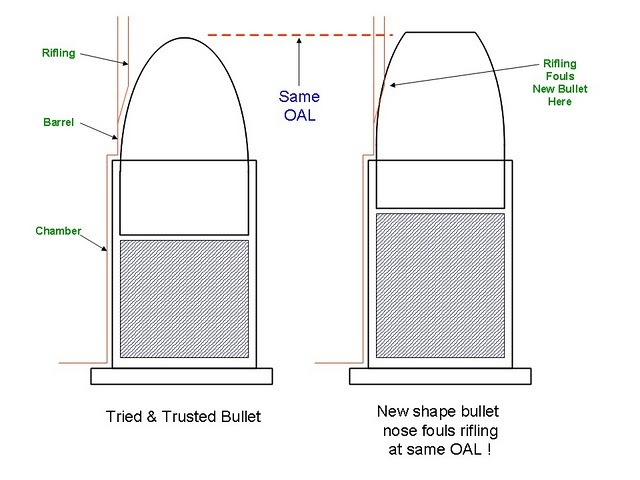 What you said "wouldn't this depend on the chamber [barrel]" is exactly the issue -- you get Max OAL for YOUR barrel and YOUR bullet shape (may be different for another type in your barrel) by doing the drop test 1SOW was talking about. I'm loading Berry's 124g 9mm HBRN at 1.140" OAL in my 75B. Using the drop test I found my barrel's physical Max OAL is 1.21" for that HBRN. However we know SAAMI max OAL for 9mm is 1.169" so my OAL is limited by SAAMI max OAL not my barrel's max OAL. Take 1.169" - 0.015" = 1.154" Max OAL for that HBRN in my CZ's barrel. I'm curious did you try to shoot the S&B 124g RNs? It's my understanding S&B ball ammo is what CZs are designed with/for. Hope this helps find the right load parameters for your CZ and bullet. To date my reloads have been flawless in my gun using the drop test method I learned on this forum. Yeah, that's what I thought, it's relative to my chamber/bullet combo. I've done a fair amount of reading and experimentation reloading so far, and the chamber depth issue seems simple enough. I guess I figured as long as I stayed on the light-mid range in terms of bullets, I'd be okay in terms of OAL. I understand the drop-test, but what I don't understand is how you determine what to order, particularly if you can't buy locally what you can order or vice-versa? Is there another way to make sure you don't end up with a bunch of bullets you can't load/shoot? Is there a secret to getting a sample of various bullets from a manufacturer, in order to set up dummy loads for the drop-test? I'll definitely be buying only RN in 9mm from here forward, and I'll probably stick to 115's or maybe 124s. I haven't tried firing the S&B's although I did load up some of the FP's, at 1.06, 1.07 and 1.09, and am hoping to find some time tomorrow to stop by and do a quick test on each. I loaded them all really light (I typically only load at 50-75% of max anyway, often more like 25% of max, the paper doesn't know), to keep things safe since I've got them seated so far down in the case. I'm hoping I can load them at 1.09, although I'm not sure how I'll know which really worked. When I loaded the dummies last night at 1.15 and 1.10, the action "seated" them for me, down to about 1.07-1.08, even though I'd put a pretty heavy taper crimp on them. IMHO, when you say that, you are simply going to the other extreme. That's not what we're saying at all. It's true, most all RN fit the CZ chamber better than other shapes, but that's no reason to stop all other choices. Sometimes you want a nice clean hole in paper targets that a FP will deliver. At those times you simply have to be more careful in your bullet selection. How can you best choose a bullet new to you? Well, the only way I know is to ask here. Collectively, we've ordered most all the commonly available bullets... and yes, stumbled and fumbled our way to a useful OAL with most all of them. So, what bullet shape - weight would you like to order? If you take out your barrel the loaded round should be able to drop in and out of your barrel on its own. I'm not sure what you mean by "seated". Also you don't want a heavy taper crimp, that will only serve to increase pressure. If you search the forum for taper crimp you'll find some good info on that too. I called Berry's and ordered some free samples when I was working up loads for my .40 75B. They wont send you a ton of course, just enough to test with and wet your appetite. They give great service and to date with my limited needs I've only bought Berry's bullets. Hi Outdoor ! If you think your chamber is short, you'd be scared about mine. I load 124g Berry's hp at 1.018 OAL. with good accuracy and soft recoil. I too stay on the moderate side of the powder load as I know my OAL is shorter than published loads. Thanks for all the useful replies, I think I've got somewhere to start now. Given what others had to seat their bullets down at (OAL), I'll test my "short" loads and if they feed, I'll just load some specific rounds for the CZ and label as such. For now I've got to use up my lot of FP bullets, and some HPs I have for 9mm as well, but if I decide to go with something other than RN for 9 in the future, I'll definitely check with everyone here as to which they've had success with (without having to seat so close to the minimum OAL). I should've started here, it just never occurred to me that my CZ would have given me this type of grief, if you can call it that. I think my reloading experience to-date has been a little too smooth, for the most part. How about having a sticky with the brands/weights/shapes of bullets that work with a standard OAL? Is this too much of an endorsement? It sure would be handy, and could even be added to the "bullets" sticky? To my knowledge Berry Mfg, Precision Delta, and Winchester 115 and 124gr RN can be fitted to the SAAMI max of 1.169". But finding out the exact maximum is much easier than making a list. So much easier that I simply do it for all bullets. At most it takes 3 minutes, once you get accustomed to the drill. The instructions are found in THIS THREAD. RN is pretty easy, I think most of them will fit when loaded to standard lengths. For example, I know my XTreme bullets don't fit, given minimum OAL specs in published load data. At least that's true in my 75b, I guess others' barrels may differ slightly, but I'd guess it's going to be very close in anyone's barrel, regardless. Like I said, I've done this type of test in my loading for rifle, given the tolerances, but I'd never run into anything like this in pistol, in about 6500+ rounds loaded. I'd tested a couple of my .40 pistols way back when I started, and found them to have fairly long chambers and tolerant of pretty much any FP loads. This chamber shortness also is credited for CZ's accuracy. That's what they say and in theory it should be true. However, my 9mm Witness Classic (all steel small frame) and my 9x23 Witness Match, both of which have leades that are so far out the cartridge length allowed by the magazine is the limiting factor, are more accurate than my 9mm CZ75 SA. In my opinion, the short CZ leade isn't worth it. However, it's there and we just have to deal with it. Once you know what to do it really isn't that much trouble. As has already been pointed out, you just have to be careful with bullet selection. If you do the "push test" first, you'll KNOW if they feed or not. Actually, if you have several 9mm pistols, they will ALL accept and shoot the ones loaded for the shortest chamber---in your case, the CZ. Went to the range today, with my 1.06, 1.07, and 1.09 XTreme 124gr FP loads (the ones I have 2000 of, or about 1950 now ). The 1.06 were the only ones that really functioned well, and even then they were hit-miss, maybe 1 out of every 5 failed to chamber properly. I guess I'm stuck with going even shorter (some here mentioned loading down around 1.02), and reducing my loads a bit more. At this point I'm off the load-data chart, the shortest I could find anywhere was 1.07, but even my 1.06's looked okay after firing, no flattened primers or anything obvious anyway. I'm thinking about getting my chamber reamed a bit, but I'll probably start that discussion in another thread. There's a LOT of reasons cartridges won't chamber correctly with 9mm. It's actually one of the harder cartridges to load. So please don't confuse "popular" cartridge with "easy to reload" cartridge. Since there are multiple reasons ("variables" in mathematical speak), guessing at the OAL is not helping you in this situation. With 9mm you need to actually KNOW your max OAL. That way, if your cartridges are being constructed shorter than the "max" and you are still having issues, then you can positively discount the OAL as having any effect on the issue and directly pursue the real cause, having ruled out OAL as a cause. I'm not trying to make light of your situation here, but in the time it took you write your last post, you could have found the correct OAL for your bullet-barrel combination and been moving toward a solution. That's the beauty of the "scientific method". You move from fact to fact, building knowledge each step of the way. Sorry my friend, but since it's your barrel and your bullet, there's not really a way anyone here can help if you don't want give us some hard measurement numbers.